Easy inventory control software is but a click away. Take control of your inventory today! "Simple, easy to use - perfect!" "I was up and running in minutes!" "A real life saver thanks!" "I am really impressed with your company and support all for such a very reasonable price!" Easily see customers that have ordered inventory. Wizards automatically set up our inventory control software how you want it. 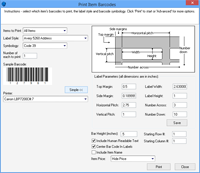 Generate and print inventory barcodes to standard printers. Includes both Built-in and Custom Invoices. Create invoices faster than ever before. Get to know your customers and increase repeat business. iMagic Inventory Software is the most cost effective and flexible inventory control and invoicing software system available for Windows. With perfect reviews from independent reviewers Tucows, UK Wares, Brother Soft, Sofotex and File Transit. iMagic Inventory is your solution that will help you to stay one step ahead of the competition. Create invoices in a snap. iMagic Inventory gives you quick access to your inventory and customer details. No more hunting around for client or stock details! It's all about staying efficient and letting iMagic Inventory do its job so you can spend more time on yours. Creating invoices in iMagic Inventory is incredibly easy. Just click the New Invoice button on the toolbar and you're away! You can easily search for existing customers or quickly enter new customer details. Stock levels are automatically updated as you add items to the invoice, allowing you to always know what is in stock. Our inventory software comes included with a number of pre-defined invoice templates that you can use. You can easily add your logo and contact details to get up and running straight away. For more control you can use MS Word to create your own custom designed invoice templates. Keeping track of customer details is important. Not only does it allow you to build up a database for Marketing and Sales in the future but it also saves you the hassle of re-entering customer details for repeat visits. iMagic Inventory helps you to do this by automatically saving customer details as you enter invoices. You can also import existing customer details from other systems and export out to other applications such as accounting or email systems. Perfect for E-Mail or Postal Marketing! Track your inventory items with ease. iMagic Inventory allows you to keep a list of all your inventory items and record details about them, including item codes, total stock, warehouse and bin locations, barcodes, category and sub-category, multiple pricing (such as retail, wholesale, specials, etc) and many other options are available. If you need to record information for an inventory item that isn't covered then you can add custom fields. Full barcode support saves you time and hassle. Simply attach a barcode reader to your PC and it will fully integrate into the software, saving time and reducing errors by scanning stock. Print barcodes from iMagic Inventory in standard formats directly onto labels. iMagic Inventory is so easy to use, you wont even need the manual. No cryptic buttons or options, our software lets you see your inventory while you manage it. Use our easy to use interface to enter stock details and your stock will be managed before your eyes. From entering stock, to selling stock and reordering stock. If you need to track items by serial numbers then you'll need iMagic Inventory's Item Tracking feature. With the Item Tracking feature turned on iMagic Inventory Software will automatically track the movements of individual items around your system. It can also be used when you want to be able to perform specific "actions" on a stock item, such as check-in, check outs, manufacturing, maintenance, tracking updates or anything else can be defined and tracked. If you're involved in Production or selling bundles of items then you'll know how hard it can be to track sales and use of many items. iMagic Inventory makes this easy with our Item Groups feature. Allowing you to link several items together and update the stock levels automatically. The combined or individual items can then be shown on your customer's invoice. iMagic Inventory is the most expandable inventory system available. The standard version allows you to directly link into MS Office, allowing you to use your existing software. Need a mail-merge? Then use MS Word. Need custom reports? Then link into MS Excel or MS Access. Need a custom invoice layout, then modify it in Word. Worried that you'll have to change your inventory system as your business grows? No problem! iMagic Inventory is also available for use with Microsoft's SQL Server, which can support 524,272 Terabytes. That's a lot of data! With an economic down turn more than ever you don't want stock taking up valuable space and with iMagic Inventory you don't need to. Using our unique interactive reporting system you can replace unpopular stock with more profitable items. Just click and select the item to view, easily finding the most efficient balance of inventory. Tired of tracking when to order in new stock items? Or even worse turning customers away due to insufficient stock being available? Then use iMagic Inventory's automated reordering system. The automatic system allows you to set the stock level you want to reorder at. iMagic Inventory Software will then take care of the rest, automatically generating Vendor Reorders as the stock levels start to get low. Share your database across your network. iMagic Inventory has full network support, allowing you to have access to your stock and inventory any place - anytime. Create invoices and manage stock from your front and back office. If you have Windows XP or above you can even create a Virtual Private Network (VPN) and access your data over the internet, giving you full remote management. If you need to limit which users have access to which functions then you can enable iMagic Inventory's User Access Control. The User Access Control feature allows you to assign login details for different people and then assign which sections of the system they can use. Tracking sales by Sales Rep's is a whole lot easier. You don't need to manually collate who sold what on which dates. With the User Access system you can automatically record which Sales Rep or user created an invoice and made that sale. Export out, calculate commissions and produce reports. Our production team has been developing software for 20 years; we build solid dependable software. iMagic Inventory has been built by the leading inventory control software and software scheduling company. Unleash the full potential of your business with iMagic Inventory! Buy now for the low price of $299 (US) or try it out - download the fully-functional 10 use evaluation version. See for yourself and download a trial demo program today! Our inventory control software runs on Windows XP, Windows Vista, Windows 7, Windows 8 and Windows 10 (both 32 and 64 bit).